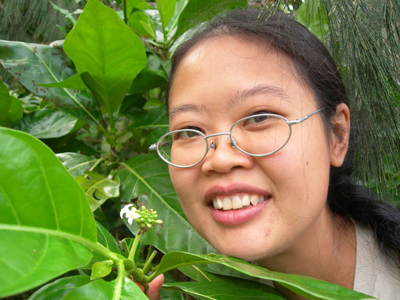 2) Malaysian collaborating Project Leader for an international level project: ACIAR Project FST/97/24 ("Insect resistance and silvicultural control of the shoot borer, Hypsipyla robusta, feeding on species of Meliaceae in the Asia-Pacific region") March 2001-2003. 2) Project Collaborator for Firefly Monitoring Project, 2005 - 2007. 3) Project Leader for IRPA Project "To develop management strategies for mahogany plantations against shoot borer attack" March 2000 - 2003. 4) Project Leader for IRPA Project "Developing integrated pest management strategies for teak (Tectona grandis) plantations in Malaysia" 1997-2001. Lim, G.T., Kirton, L.G., Salom, S.M., Kok, L.T., and Pfeiffer, D.G. 2007. Mahogany shoot borer control in Malaysia. Programme and Abstracts of the Conference of Forestry and Forest Product Research, Kuala Lumpur, 27 - 29 December 2007 (oral paper abstract). Lim, G.T., Kirton, L.G., Salom, S.M., Kok, L.T., Pfeiffer, D.G. and Saimas A. 2007. Partnering the weaver ant to control the mahogany shoot borer in Peninsular Malaysia. Programme and Abstracts of the Advanced Forest Research Science Seminar: Catalysing planted forest development and biodiversity conservation, Wisma STA, Kuching, 1 - 2 November 2007 (oral paper abstract). Lee, S.S. & Lim, G.T. 2003. Pest and disease outbreaks in Malaysian Forest plantations. Proceedings of the 6th International Conference on Plant Protection in the Tropics: Globalization and plant protection in developing economies, 13 August 2003, Pan Pacific Hotel, Kuala Lumpur, Malaysia. Published by Malaysian Plant Protection Society (MAPPS) and CAB International. Lim, G.T., Kirton, L.G., Salom, S.M., Kok, L.T., and Pfeiffer, D.G. 2007. Mahogany shoot borer control in Malaysia. Paper presented at the Conference of Forestry and Forest Product Research, Kuala Lumpur, 27 - 29 December 2007. Lim, G.T. 2007. Enhancing the weaver ant, Oecophylla smaragdina (Hymenoptera: Formicidae), for biological control of a shoot borer, Hypsipyla robusta (Lepidoptera: Pyralidae), in Malaysian mahogany plantations. Talk presented at a Ph.D. seminar. Virginia Tech Entomology Department, USA. 4 April 2007. Lim, G.T., Kok, L.T., Kirton, L.G. & Salom, S.M. Growing mahogany sustainably in partnership with the weaver ant, a biological control agent of mahogany pests. Poster presented at the Graduate Student Assembly 23rd Annual Research Symposium. 28 March 2007. Graduate Life Center, Virginia Tech, Virginia (awarded 2nd prize). Promoted US-Malaysian relations following award of the Malaysian Fulbright Graduate Study and Research Fellowship by the J. William Fulbright Scholarship Board, sponsored by the U.S. Department of State (2004 - 2007). The study of ants is my passion. It is immensely fulfilling to be able to play a small part in the conservation of our forests through ant research. For example, the successful application of weaver ants to control a major mahogany pest may allow the cultivation of mahogany in plantations and possibly reduce logging of natural stands. I consider myself very fortunate to have been given this privilege to serve our planet with all you nice ant folk!